There are the fashionable who maintain that one can never be too rich nor too thin. These days, too rich is getting harder to nail down. Too thin is all too evident. Yes the global crash may be squeaking to a halt, but it isn’t getting extraordinarily better quickly enough. Governments can and should help. But they can’t do everything. When times are tough, ordinary people band together to soldier on. I believe that in this great experiment of ours, we either succeed together or we will fail together. Keeping the hope of equality of opportunity alive is a full time job. Especially if you’re distracted by mounting unemployment, down markets and worse. Last year Meg and I decided that things were getting too desperate for too many people and decided to harness the power of the internet and ‘sphere to do some good. We did. And you did, too. April Food Day was born because this kind of hunger, this kind of need is no joke. You’ve probably given a lot already this year. Haiti got my help, among other causes. This Easter weekend at the end of Lent, I’m asking for more than your attention. I’m passing the plate, or hat in my case. I’m asking that you do more, once again. I’m asking that you contribute at least one dollar (USD$1) to help feed the hungry. Hungry isn’t skipping a meal. Hungry is going to bed hungry, waking up hungry and going to bed that night, hungry again. This year Feeding America has given April Food day a special link in order to track the good we do. Last year 150 bloggers picked up the cause. This year, please blog about it, tweet about it, add it to Facebook. But whatever else you do, please donate that $1.00. It makes a huge difference. 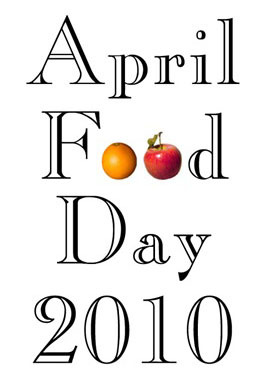 If you’re reading this in a country other than the U.S.A., please start your own campaign for April Food Day. Let us know and we’ll add the links to the webpage. Hunger knows no bounds. I hope that our combined generosity won’t either. Feeding America’s nationwide network of food banks is feeding 1 million more Americans each week than we did in 2006. This entry was posted in Uncategorized and tagged April Food Day. Bookmark the permalink. I sent an email to one of the food blogs I read about your April Food Day, including your name, Meg Fielding, etc. so maybe this will be added impetus to helping others at this time. Thanks bg! This is an uphill battle, but with that kind of help, we’ll get there. Thanks for doing this and for sharing! We were happy to be a part of April Food Day!